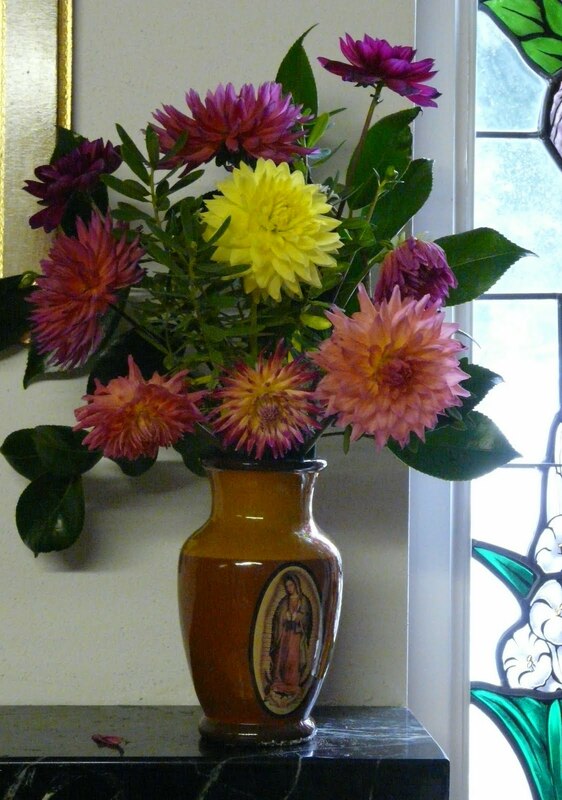 Lynch Creek Dahlias: Fall Color: Find It in the Dahlia Garden, and Bring It Indoors! Fall Color: Find It in the Dahlia Garden, and Bring It Indoors! Fall's a wonderful time to bring garden color indoors. Cooler evenings and mornings and shorter days find people looking for color indoors, and this time of year, dahlia flowers claim center stage when it comes to color. Hot pinks, rich salmon and orange hues, bright and deep reds, lemony yellows and bronzes, all predict the warm hues of the deciduous trees that will begin to turn color before long. 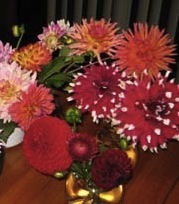 To make a beautiful dahlia arrangement, start with fresh-cut flowers. If you don't grow dahlias yourself, go to a local grower or check out your local farmer's market. 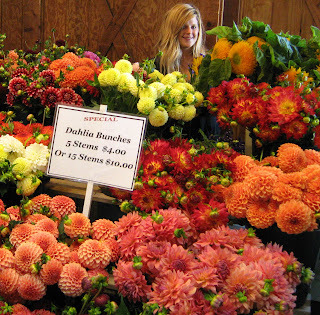 Chances are you'll find several vendors with great dahlias for you to take home. If you grow your own, be sure to cut fully open, but freshly open, blooms. Use sharp scissors or a knife designed for cutting flowers. Condition the dahlias by recutting the stems and immersing them up to within a couple of inches of the blooms in lukewarm water. If you like, you can add a conditioning aid or cut-flower food. Let them stand for a couple of hours before arranging them. Make your arrangement in a clean vase. If you use floral foam, be sure to use a fresh block so there is no residual bacteria from previous plants. Dahlias actually prefer to be in just water, so consider a glass or spiral-metal flower frog if you need to stabilize the stems. Keep your flower arrangement away from any heat source, such as sunlight in a window or a television or other appliance, since this can dry out the flowers prematurely. 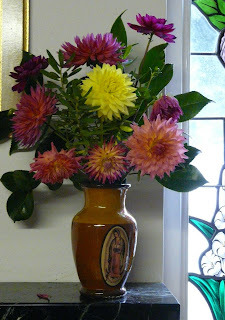 Change the water in your dahlia vases daily. It's even a good idea to rinse the stems so that bacteria don't build up along them. Your dahlias should give you great delight for a week.